Thermography can be used for a variety of inspection purposes. It is a very effective way of locating problems or potential problems with building fabric and construction, as well as electrical and mechanical issues. One of the great advantages is the visual feedback to help quickly identify areas of concern. We offer thermographic surveys of your property, either domestic or commercial, to highlight areas of heat loss and wasted energy. 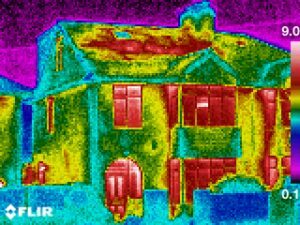 Thermal imaging can highlight faults and defects such as missing or poorly fitted insulation; air infiltration (draughts); poor air tightness; thermal bridging and damp. 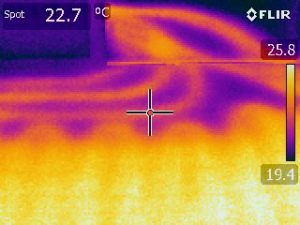 The camera works best under fairly precise conditions but in general, the cold, winter months are best for building heat loss surveys as there is then a significant difference between internal and external air temperatures to highlight the differences. Thermography can highlight electrical faults and find problems before they become both dangerous and expensive to fix. Overloaded circuits and poor connections are typical issues. Mechanical parts, such as motors, pumps and turbines can overheat if under excess load or when they become worn or faulty. Replacing them before they cause damage to other plant and equipment could save a lot of money. We can also assist builders, plumbers and homeowners to quickly identify heating and hot water pipes contained within the building fabric, such as under floor heating and assist with leak detection. This could save hours of time and the cost involved in removing flooring to search manually for problems.